Download and view this project in action! Cut out the template shapes and trace them on your material. Cut the pieces out being very careful not to bend the body. The body must remain very flat so air from the balloon can support it's weight. Have an adult cut the slot with a sharp knife and be sure no excess material remains on the bottom. If using styrofoam for the body, slant the slot back on the bottom for better air flow to the back of the craft and more speed. Remove any debris from the cut. The bottom should be very smooth. Cut a flex straw so there is one inch on both sides of the flex part. Cut a sharp angle about 3/4 inch long so the straw can be glued over the slot at a sharp angle. (see photo) Stretch and bend the straw and glue the 5/8 inch circle to the top end. The hole in the center on the 5/8 circle can be made with a hole punch or a sharp pencil point. Glue this assembly over the slot on the body. Stretch a 7 or 9 inch baloon over teh circle. 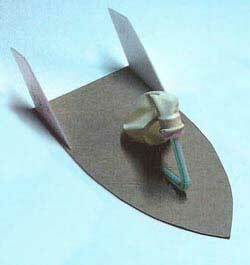 Glue the 2 fins to the rear sides of the body to hold the inflated baloon in the center of the body. The baloon is inflated by blowing into the slot from the bottom. Pinch the neck of the baloon and release on the floor. If your hovercraft does not run straight check to see if the floor is clean. Inspect the bottom of the craft for any fuzz or dirt. 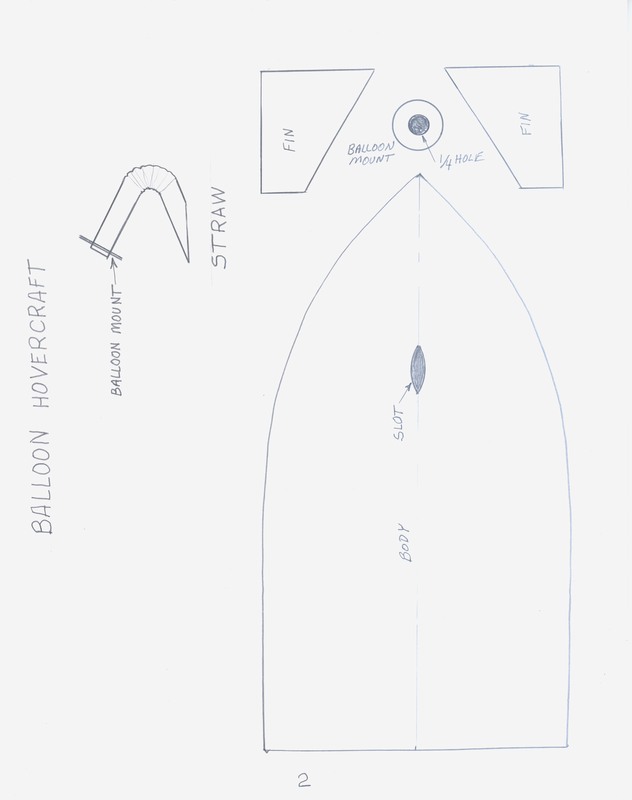 Be sure the straw is over the center of the slot and the baloon is centered over the body. Keep experimenting and try different sizes and designs to get the best speed and distance. Mark and cut a 4 ½ inch wide and full length piece from the center of the 9 inch foam plate. Glue the 2 edge pieces together and mark the axle position by laying a 5 inch wide cardboard rectangle on the bottom. Mark the edges of the foam so the two axles are parallel and the car rolls straight. Glue a 4 1/2 inch piece of the large straws on the front and rear marks. Insert a 5 inch piece of the small straw thru the large straw for the rotating axles. Draw the 4 two inch diameter wheels on the remaining foam plate with a compass. Cut out carefully and push a pencil through the center. Mount and glue the wheels on the 5 inch straw ends so they roll without wobble. Cut, fold and fit a 5x1 piece of plate for the straw and balloon mount. Glue in place above the rear axle as shown in the photo. Cut a 3 inch long piece of the very large straw and make a 1 inch long cut in one end. Squeeze and glue or tape this end about 1/3 the original size. Cut a 5/8 inch diameter piece of plate or cardboard and punch or cut a center hole the size of the straw. Fit and glue on the other end of the straw. Stretch a 7 or 9 inch balloon over this circle. Glue the straw on top of the mount. Inflate and release on a smooth surface. Have fun and experiment by trying different exhaust hole sizes and baloon sizes for best speed or distance.